To think that this guy lectured other physicians all the time … especially physicians who charge a fraction of his ridiculous fees. » especially physicians who charge a fraction of his ridiculous fees. I have never spoken about this publicly before and I do wish to do so now. But the split with my sister, Dr Campbell in 2006 was painful traumatic and turbulent for all concerned, including her. As a result, I lost all administrative staff at the Moorebank Practice and was looking for alternative premises. I was in a very difficult position for many months and realised that my 100% focus must be only on the patient and making sure all equipment was perfectly sterilized, and the most perfect and safest procedure delivered every day. The paperwork would be sorted later. Comprehensive DV Recording was still done for every patient. I had the opportunity to order bulk drugs from a wholesaler ( Clifford Hallam) but refused to do so as I didn’t want large quantities on the premises for safety reasons. My pharmacist was literally immediately across the road. I had been working with them in a trusting relationship for 18 years. But they had a large rotating staff who knew me well, and they were fascinated by my work and often asked me if I did anyone famous. So I started writing “surgery use” on the scripts for patient confidentiality. One day the pharmacist, who I trusted implicitly, told me to write a name on the script for some rebate reason. I refused and made it clear I would get it from the wholesaler. Afraid of losing my “business” and income, she told me it was perfectly OK to write my name on the script. I questioned this, but she said it is implied surgery use as it is actually MY SCRIPT PAD. I was vulnerable to such peripheral issues and took her advice. This was the greatest mistake of my career. Doctors are allowed to self treat and medicate, but for a limited time. Due to my circumstances, I had to extend that period. The medical board is satisfied that I had a severely painful legitimate condition for which medication was justified. But I should have gone through the correct channels. My circumstances were difficult and I took a short cut, as many doctors would also do. They are also aware that in 27 years I have A PERFECT PATIENT SAFETY RECORD. OF PARAMOUNT IMPORTANCE, IN THE LAST 20 YEARS BEING INVOLVED IN THE HT INDUSTRY, MY RECORD IS PERFECT DESPITE NEVER HIDING BEHIND LEGAL DISCLAIMERS. THERE HAS NEVER BEEN A COMPLAINT, HARM, DISFIGUREMENT OR DAMAGE TO ANYONE. The charges against me were of a PAPERWORK ADMINISTRATION NATURE where I made errors of judgement and an honest mistake. IT HAS ABSOLUTELY NOTHING TO DO WITH PATIENT CARE OR OUTCOMES. In Australia, the USA etc doctors can cause unspeakable damage and disfigurement to patients, and get away absolutely free especially in the HT Industry. In signing a DISCLAIMER or WAIVER, the Medical Boards will say that the patient was fully informed that a bad result may occur, therefore, tuff luck. The second reason is STANDARD OF CARE. Doctors may be aggressively competitive, but if one winds up in court, they close ranks. The judge asks what another HT doctor would do in a similar situation. And since they fundamentally do the same thing, and they ALL could be in the SAME BOAT, they agree that correct procedures were undertaken, and it was not the doctor’s fault. They thank each other, and pledge to return the favour when required, and it inevitably is. There is also the statute of limitation. I think its 2 years. By the time the patient realises how much donor destruction occurred, or more hair is lost and the hairline is too low etc, it is too late for civil action. But the Medical boards can still act. IF ANY DOCTOR OR THEIR FORUM TRAWLERS POINT THE FINGER AT ME, I CHALLENGE THEM TO PUBLICLY RESCIND THE DISCLAIMERS THEY HIDE BEHIND. The Medical Boards will be flooded and I suspect a large percentage of HT docs would be DE REGISTERED or thrown in jail for unjustifiable sadistic brutality toward patients. They only need a few disasters each. And MOST DO. I see it regularly. If any doctor, or their forum shills mention this episode, DEMAND that a disclaimer is not signed for your surgery. See how far you get. And while consulting a doctor, ask who is “THE BEST IN THE WORLD”. One way or another, they will tell you they are. Because we are globally competitive, and patients will travel to get “the best”. They have no choice but to be grandiose or narcissistic. A doctor on the tribunal asked if I met accreditation standards. I was reminded I was under sworn oath. I replied "I EXCEED THE STANDARDS"
If it wasn’t true I would be guilty of perjury. It sounds narcissistic, but it is the truth and I can prove it. The Tribunal had no choice but to reprimand me, even though it occurred 4 years ago and DID NOT INVOLVE PATIENT CARE. Because of my situation I didn’t get to see my doctor friends very often. If I did, someone may have pointed out that the pharmacist gave me deliberate false advice and I unwittingly fell for it. That is why the Tribunal wants me to spend some quality time with one of my medical colleagues. Not for any medical reason, but to chat. They are 4 years late, I am spending a great deal of time with surgeon friends (not HT, I mean general surgery). My sister and I are speaking, and will always help each other out if necessary. As for the pharmacist involved, a complaint has been lodged with the Health Department and I am considering legal action. I am also intending to appeal the decision. Let’s be clear here (and fair). This tribunal reprimand relates to administration issues concerning prescription practices. 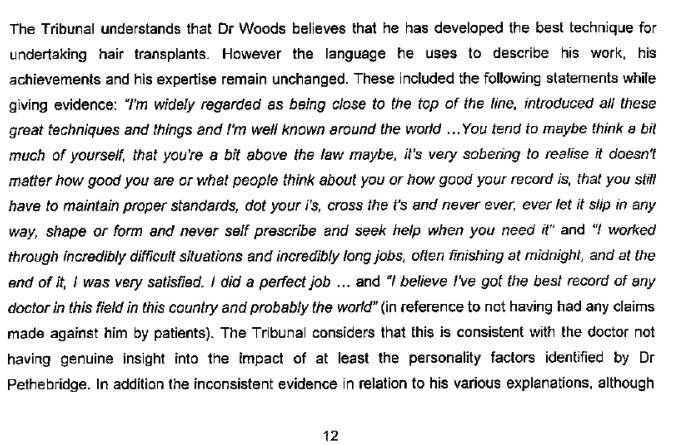 There is no suggestion whatsoever that the quality of Dr Woods work has been compromised. i have studied quite a bit of psychology and i kind of think the same when i read his posts!! 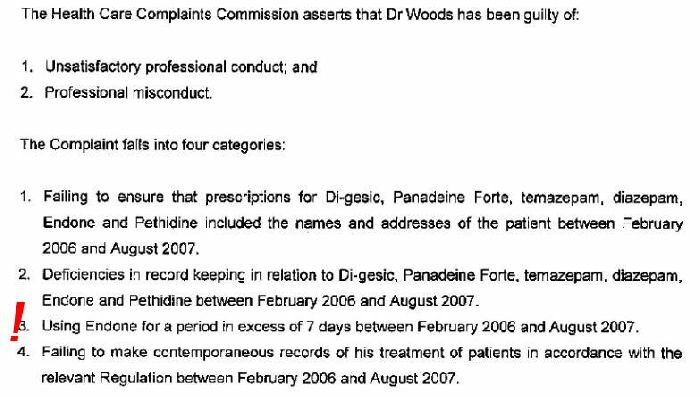 Basically, the Medical Tribunal’s decision just relates to administration issues, concerning Dr. Woods’ prescription (mal-)practices during a specific (hard) period in Dr. Woods life. That’s basically all. 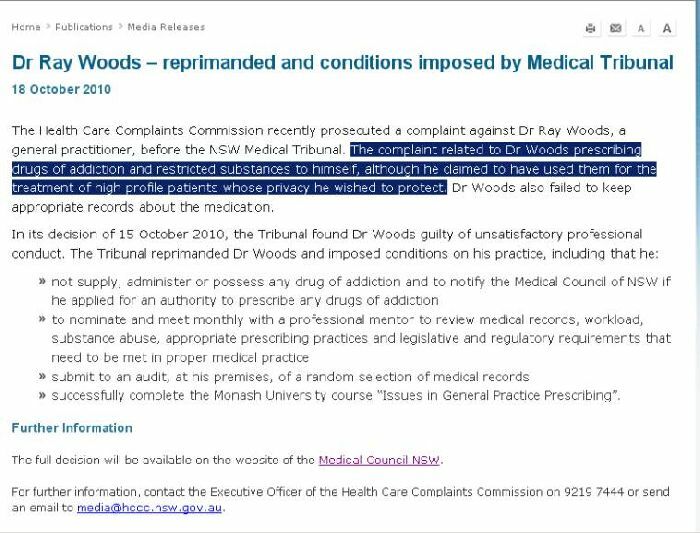 That means, nobody here –once again- NOBODY here is entitled to attack Dr. Woods concerning this decision by a Medical Tribunal in Australia - basically. If somebody would ask you “Dr. Woods, do you have a ‘God Complex’?” what would be YOUR answer ? If you’re unsure with your answer, maybe the following “God-Complex-TEST” can give you a plain answer ?! » Health Department and I am considering legal action. » I am also intending to appeal the decision. … I can assure you, you WILL lose! Actually, you’ve already lost this issue during writing of these intentions. Concerning your sister, Dr. Angela Woods-Campbell, and whatever she is saying concerning this whole issue, you should take her advice. And just HER advise! “Basically, the Medical Tribunal’s decision just relates to administration issues.” Agreed. » i read his posts!! In reporting about this matter, the HCCC made a serious and damaging incorrect statement. THE MEDICAL TRIBUNAL , IN ITS INVESTIGATIONS AND DELIBERATIONS AGREES. So the question is, whether or not the HCCC is entitled to make these claims (public), resp. whether or not the HCCC is committed to “rectify this serious and damaging error”. is Dr. Woods right with his claim and intention in his last post? (unfortunately) it doesn’t matter WHO said WHAT and WHO did finally WHAT. » » Health Department and I am considering legal action. » » I am also intending to appeal the decision. » issue during writing of these intentions. » I wish you all the best! » the greatest mistake of my career. Iron Man. Instead of making these big drama posts on Dr. Woods. Why don’t you just come out and ask a specific question is to what you don’t understand. I think it was stand up for Dr. Woods to address this publicly on a forum. And his lawyers now are contacting the Australian medical board about there error. You see how things get confused when all the facts are not in? » this serious and damaging error”. » is Dr. Woods right with his claim and intention in his last post? Yes I can and apparently so can everyone else. Just ask a specific question to the doctor. Bottom line It was administrative error. Well if the HCC made this availiable it is there duty to correct there errors don’t you think? I guess Dr. Woods lawyers will take care of that. Who has the time to read all that, what is this about? 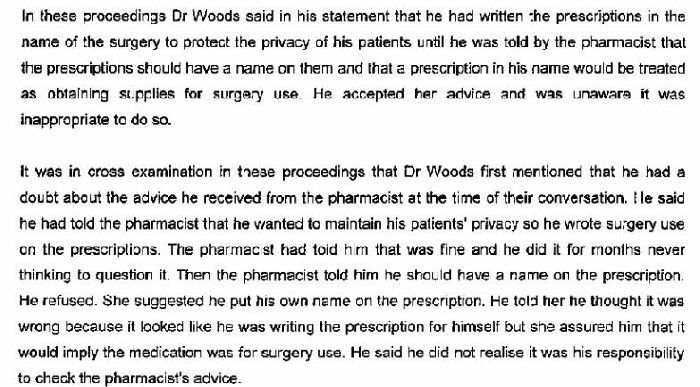 Woods writing scripts to his patients without proper records? Is that all? I mean c’mon !! Unless his clinic is in some health code violations, what has this got to do with anything !! This is pretty funny too: "Some aspects of the doctor’s practice are unusuaL. He gave evidence of leaving patients during a procedure to walk across the road to the chemist to fill a prescription for medication to use during the procedure. After he moved to Dulwich Hil he said he would drive 500 metres to the chemist “just jump in the car and just race up … I’d quickly fill in the script. I’d give them a call, tell them I’m coming.” "
Whom ever said this: “Dr Woods had narcissistic personality traits being a grandiose sense of his self importance” was absolutely brilliant. I honestly don’t give a shyt what he prescribed, to who he prescribed, what happened with his relationship with his sister, or what paper documentented trail he left or didn’t leave. He’s a lisenced doctor! And whether or not he is a good upstanding hair transplant surgeon should not be nullified nor muddied in any way, shape, or form by the article. The statement that I would leave the patient at dulwich hill to get medication for them happened maybe only a one, two or three times in three and a half years, if staff were sick. Now, there are many cases of patients who got HEPATITIS B, C and AIDS in medical centres. IT HAPPENS. I PERSONALLY CHECK WIPE CLEAN AND STERILIZE MY WORK AREA TO BE 1000% SURE IT IS PERFECT AND SAFE FOR MY CLIENTS. And by the way, how many techs are medical?? Who is cleaning the equipement ? ?, manning the autoclaves and making sure there is no error or malfunction ? ?, making sure everything is perfect for your protection ??? I regard these jobs as important as the surgery itself. So I oversee it, and do much of it to ensure PERFECT SAFETY. Some may call this a narcissistic statement.